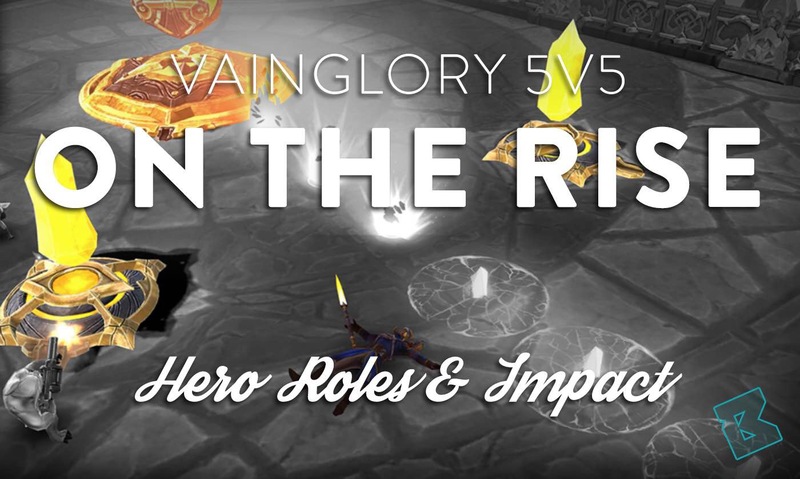 Vainglory 5V5 early game rotations and jungle decision making have the largest impact on the early game. Here, slight advantages are gained, expanded, and ultimately translated into kills and captured objectives — ideally beginning the snowball that carries you to victory, or preventing the snowball carrying your enemy to their goals. 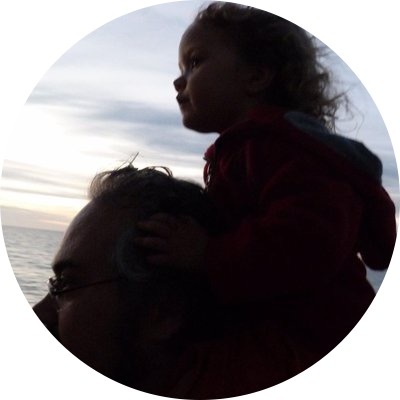 What dictates choices are the map design, camp spawn times, and background mechanics of the game. For example, some players expressed disquiet when they saw the Sovereign’s Rise map for the first time due to its similarity in design to many other 5V5 MOBA maps, and thought that would completely dictate the meta and rotations. Thus, making Vainglory feel like an attempt to recreate League of Legends on a mobile device rather than an authentic and legitimate Vainglorious experience of its own. However, the mechanics built into the map render the classic LoL meta and rotations less efficient in two vital ways. The first is the long standing ambient gold mechanic in Vainglory. This incentivises farming in duos for the substantial jungle camps (Gold Toad and WP & CP Buff Treants) and poses trios as less efficient due to the third player missing out on the ambient gold. Likewise, a single hero taking one of these camps again costs the team the ambient gold that could have been generated. This means that efficient rotations are less rigid than LoL rotations. Even in the laning phase, an efficient rotation includes the laners roving into the jungle to take camps (such as Healing Treants near Top and Bottom) or share the ambient gold with the jungler who takes the camps. It’s also generally better to position the captain in mid lane rather than hugging bottom lane — Vainglory’s WP ranged carries are considerably more robust than League’s, and thus necessitate less babysitting. In turn, this allows the captain to roam more effectively to whichever lane needs help more rapidly from Mid because of Blackclaw Rush’s directional speed buff (or they can stall mid lane, freeing up the mid laner to rotate). This was seen in the first show match, where Renegades racked up an impactful gold lead over the EA team through more efficient placement and rotations. For working out an efficient rotation, it’s worth noting that the WP and CP buff camps spawn at 55 seconds, whereas the other jungle camps all spawn at 1:05. This makes it most efficient to initially focus on these buff camps, trying to capture them, and then rotating to another jungle camp as it spawns or up to lane. The lane minions all spawn at 45 seconds, but due to the lanes being long, they reach Mid at 1:05, and Bottom/Top at 1:15. Because of this, you want your laners to their lanes shortly after that so they don’t miss any farm. The next wave spawns at 1:15, and reaches Mid at 1:35 and Bottom/Top at 1:45. This continues every 30 seconds, with every fourth spawn replacing the big minion with a captain minion. Jungle minion camps are indicated on the mini-map when they initially spawn. Once they are taken, though, you will only see them accurately on the mini-map if your team has had sight on their spawning location at some point after they have been captured. You can use this to acquire an impression of the enemy junglers’ and laners’ likely rotation by watching for the respawn of those minions after having sighted the camps — or better yet, by setting vision here. In the jungle, normal camps respawn after 100 seconds, while the WP and CP buff camps respawn every 160 seconds (buffs last 90 seconds). This staggered spawn rate makes it very difficult to build an efficient, scripted jungle clear like there is in 3V3 — where effectively you rotate through the jungle, clearing like clockwork and then up to try to gank, port home, shop, and then repeat. Here are two alternative opening rotations. These depend on whether you have a decisive level 1 advantage and the ability to back out of an early engage while keeping your team alive; if it turns out the enemy has more players present. The first rotation is relatively passive and focuses on securing your control of the early jungle objectives in your jungle along with maximising income. It was used by both Renegades and TSM in the second show match of Worlds 2017. First, simultaneously focus on both your WP and CP buff camps — ensuring the buff goes to the player you want it to. This could be the top, mid, or bottom laner or the jungler. The decision depends on which hero they are playing, whom they are against, and what you have determined to be your primary objectives in the early game. The captain holds or pushes Mid solo while placing vision. If they are an aggressive captain with boots and escapes (e.g. Lyra, Flicker, Grace, Glaive), then invade the enemy jungle and contest one of the buff camps. Preferably WP and/or the enemy Gold Toad for an early gold swing. Gold Toad is worth 200 gold to the hero who captures it, and 170 ambient gold to their ally. Stealing it is in effect a 570 gold swing in favour of your team! Mid and Top proceed to the CP buff, with the top laner tanking the buff and either Mid or Top taking it; depending on what is advantageous. They then either rotate up to the top Healing Treant together where the captain can join them or continue to freeze mid lane, in which case the top laner will tank and take the Healing Treant. The mid laner drops to lane, while the captain rotates up to share the ambient gold from the Healing Treant. If you are feeling reasonably strong, then the captain, Top, and Mid could rotate into the enemy top jungle and try to contest their Healing Treant. Remember, though, that this will almost certainly sacrifice lane farm. Meanwhile, the jungler and bottom laner take the WP buff together — often putting it on the bottom laner to aid their farming and lane pressure. Following that, they head down to the Gold Toad together, and then up to the Healing Treant. During this opening play, I suggest that scout cams are placed to protect the main two entrances to your jungle from the river near each buff camp. Alternatively, you could push up the line of vision in some locations if you wish to be more aggressive. After that, if the enemy laner in their Top (which corresponds to your Bottom due to the mirrored map) has already reached their lane, and pushed it to overextend, the jungler should try to flank them and set up a gank. If the enemy laner is playing it safe, the jungler should help the bottom laner shove in the lane, gathering ambient gold for themselves. Then check whether the enemy Healing Treant has been taken — either providing an opportunity to take it, or gain vision on it to provide information about the enemy positioning and rotations throughout the game. They can also take this opportunity to place vision in the enemy jungle, revealing information about enemy movements. Once the lane is shoved, the laner can port home for their first shop while the jungler either rotates to gank Mid or ports home to shop. 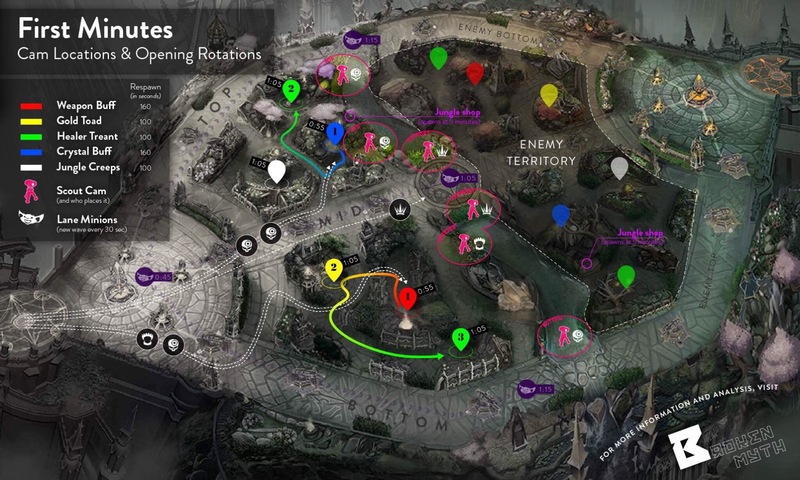 Before the Gold Toad respawns, Mid should port home and shop, and then meet the jungler at the Gold Toad before they take it to receive the ambient gold. This works nicely since the first captain minion reaches lane at 2:35, which provides a stronger wave to hold the lane. Likewise, the mid laner, captain, or top laner should rotate together to retake the CP Buff Treant when it spawns. The jungler and bottom laner should retake the WP Buff Treant when it spawns. The Healing Treants next to the top and bottom lane are the most susceptible to enemy invades. So, the laners should clear these as soon as they spawn — with anyone nearby coming to receive the ambient gold if they can. The second alternative opening rotation to the above passive version is an aggressive early invade, where you aim to steal an enemy buff camp. Usually the WP buff, as this is much more impactful in the early game. This is typically a three person invade, while the remaining two heroes secure your red buff. It’s a risky play — if the enemy has vision, they could collapse on you and achieve a numerical advantage. They could also take advantage of your focus and push for a different objective. It’s rarely worth pushing such an invade further and going for the Gold Toad as well, since you are likely to be collapsed on or fall to a counter-invade. At first shop, I recommend purchasing boots and at least one Minion Candy after farming. Candy should be carried until all of your slots are full. These are then used to push lanes while the enemy is away and help defend your lane. In turn, this allows you to rotate safely by locking an opponent to a turret. The broad principles of these rotations should be used to maximise ambient gold income. Though, where the jungler should go and what they should do becomes a matter of judgement. Take into account the opposing comps, your win conditions, and where pressure exists on the map. The best call may be to invade, gank an enemy lane, or passively farm through your own jungle. One particular denial tactic you can use is to steal the enemy Healing Treant while leaving the small minion beside it alive — since the respawn countdown on the camp doesn’t begin until the whole camp is cleared. For example, in Renegades’ game versus EA, our win condition was to succeed early and prevent the Baron and Celeste from scaling up. Because of this, our captain SNKea assisted Aeon222 on Baptiste; who, from our perspective, was in top lane to place significant pressure on the Baron in EA’s bottom lane. All the while, our jungler Chingy prowled around, stealing jungle to help relieve pressure on Vox from Blackfeather. Doing so provided ganks onto Celeste in mid lane to slow her scaling while spaghetti on Varya could farm in relative safety to build up his power and decisively dominate the mid game. 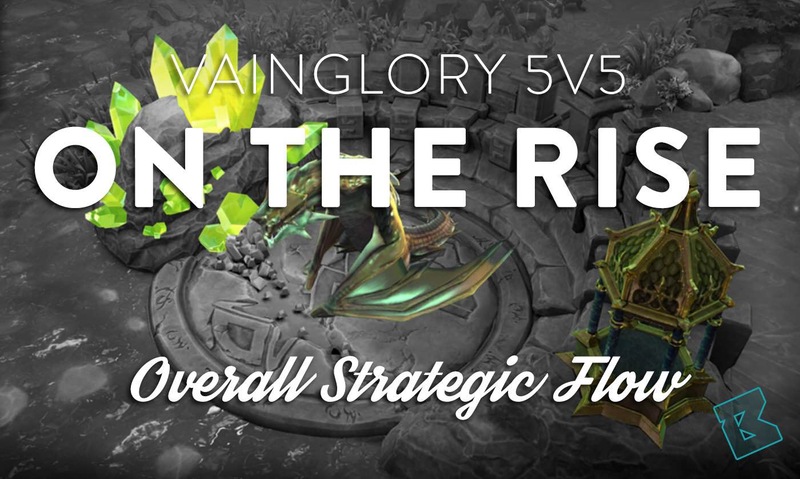 Using these Vainglory 5V5 early game rotations to farm up and chip away at their turrets allowed us to win the laning phase — and ultimately the game. Coach and Analyst for the SEA based 5V5 team Renegades - winners of both live 5V5 show matches at Worlds 2017.
i like this game .please early 5 vs 5 play game .